Successfully Added GPS Receiver + Data Logger + Photo Tagger for Flickr to your Shopping Cart. GPS Receiver + Data Logger + Photo Tagger for Flickr which shows your path on Google Maps and shares your geo-tagged photos on Flickr! Turn your computer into a GPS system! This USB GPS receiver dongle is the only hardware you need to transform your laptop, notebook, or netbook computer into a fully functioning GPS unit. Just plug this dongle into your computer's USB port and find your location right on your screen. This is great for locating your position when you're camping or planning the next day's route. 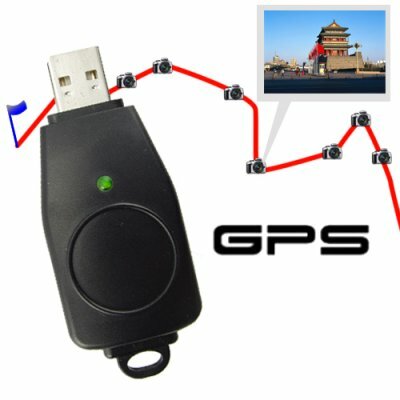 When you're driving or traveling with your computer, use this GPS dongle's data logger function to log all the GPS data of your trip. As soon as you plug this GPS dongle into your computer's USB port or car cigarette adapter, it begins logging your position, speed, and altitude. When you get home, open up the included iTravel Data Logger software package and view all your logged paths right on Google Maps or Google Earth. This powerful, easy to use software lets you view data such as the start time, end time, duration, and distance of each path, as well as your speed, altitude, and GPS coordinates at every point along your path. This is where the fun really begins! Use the included software to paste your photos and captions onto your path. Embed GPS info into your photos and upload them to Flickr. Now your family and friends all over the world can see your pictures and the exact location where you took them! Three-in-one functionality and an unbeatable factory-direct price make this USB GPS receiver a great choice for GPS enthusiasts, travelers, and resellers. Take advantage of Chinavasion's no minimum order quantity (MOQ) to order one today, or buy in bulk for greater savings. From your best source for cutting edge electronics, Chinavasion. The Data Logger and Photo Tagger functions of the CVHN-G48 only require the included software. The GPS receiver function requires GPS navigation software which is not included. This GPS dongle is compatible with most brands of GPS software - however hardware specific software such as Garmin may not run on this unit. As the wholesaler, Chinavasion provides the GPS-enabled hardware only, not the software. Chinavasion provides no warranty or customer support regarding GPS software. Chinavasion cannot provide downloads / links / advice regarding GPS software. Any software installation you undertake should be performed or supervised by a professional. The software sounds like it can do a lot: show your recorded paths, add pictures, and upload geo-tagged pictures to Flickr. Is it hard to use?